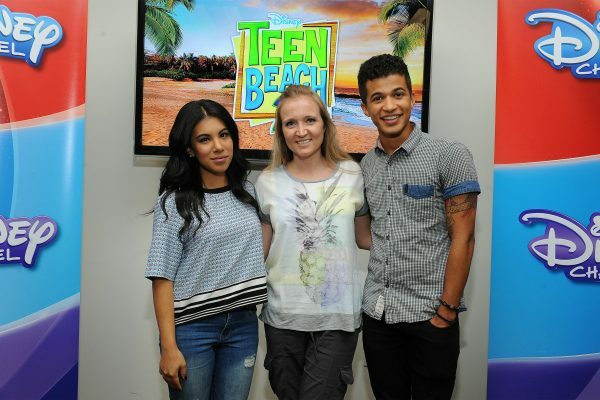 Chrissie Fit (“CheeChee”) and Jordan Fisher (“Seacat”) are two of the stars in the Disney Channel Original Movie, Teen Beach 2. If you haven’t seen Teen Beach, you’ve got until June 26th to catch up for the sequel. These two are absolutely adorable and charismatic. But I’ll be telling you more about that in a post about our Q & A session. You’re not going to want to miss the details about the hilarity that goes on behind the scenes! As for the movie itself, I’ll also be doing a full review, but here I’d like to discuss the dancing. O. M. G. The dancing. The dancing in this movie is outrageous. It’s fun, exciting, elaborate and now I can officially say: extraordinarily challenging. This is no easy task. I speak for myself when I say that I have no rhythm. Several of the other moms were really good. But I’m one of those that likes to stick to the back of the crowd in hopes of going unnoticed. Well, Jordan was onto that plan so he had each row rotate up to the front. Despite my desperate attempts to stay hidden, he was determined to thwart my plans. I have a whole new respect for the skill, practice, and dedication it takes to dance like these talented stars. After seeing the dance scenes in Teen Beach 2, I was blown away by how synchronized all the actors were. I could barely learn the few steps Jordan and Chrissie were showing us. I cannot imagine how much practice it took to get so many people synchronized perfectly. Choreographer, Christopher Scott, is clearly a genius. 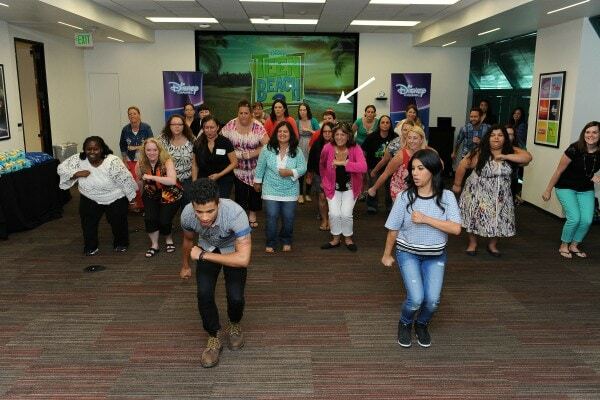 Gayle, from DisneyGals.com, has a son that is an amazing dancer. 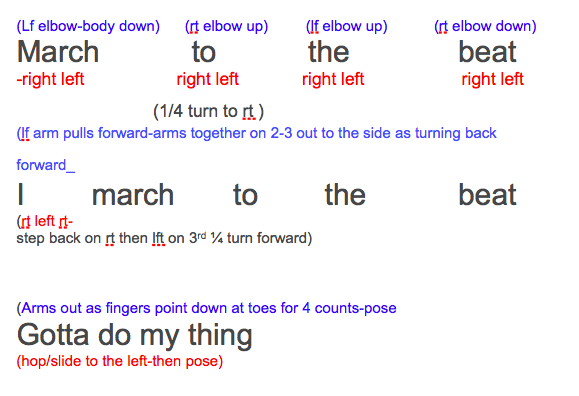 He wrote out the choreography for us! Thank you for that! Click below to print. The blue is for your arms, and red for your feet. Try it with your kids! Just look at my face. Clearly I know exactly what I’m doing. This was an incredibly fun event. 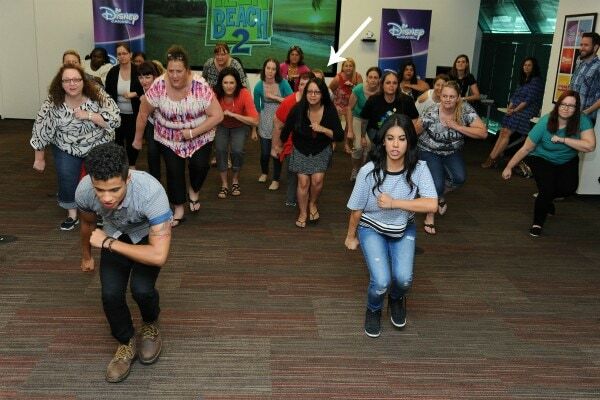 I’d like to thank Chrissie Fit and Jordan Fisher for taking the time and having incredible patience while showing us their moves. I may not be able to keep up with their feet, but I’m certainly going to keep up with their tweets and you can too. Follow Jordan and Chrissie on Twitter! What’s your favorite dance scene from Teen Beach? I loved “learning” Gotta Be Me. Don’t think they’ll be calling me up to help dance anytime soon but it was fun! Looks like everyone had a fun time. I know my wife was all over the place – she even admits so! Well that looks like loads of fun. I bet my kids would enjoy it. Looks like a fun movie and the dance moves look awesome. I am sure ti was a blast! This looks like a great summer movie. That looks like so much fun! No matter how you think you did, I can assure you that if I’d been there you would have been dying laughing. You know what that face is? That’s the face of a champion. Totally nailed it. What a fun & frustrating time that must have been. Never seen the show. What a un event for the kids and entire family! Dancing is always a great way to have fun and makes you happy. What a fun memory! I would have been right out there with ya!